This is probably not a comparison that any pastry chef would ever wish upon their wares, but I am no pastry chef, so I have no problem with it. This tasted like an apple toaster strudel! 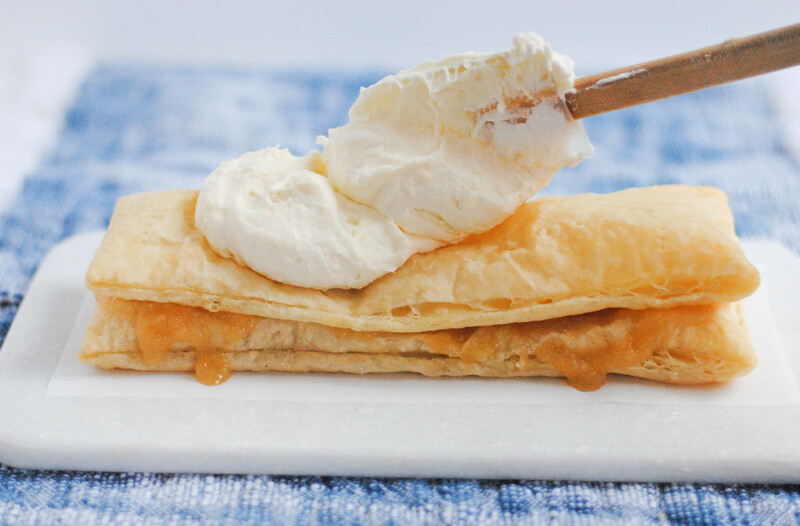 The best apple toaster strudel you have ever had. Ever in your life. Ever. 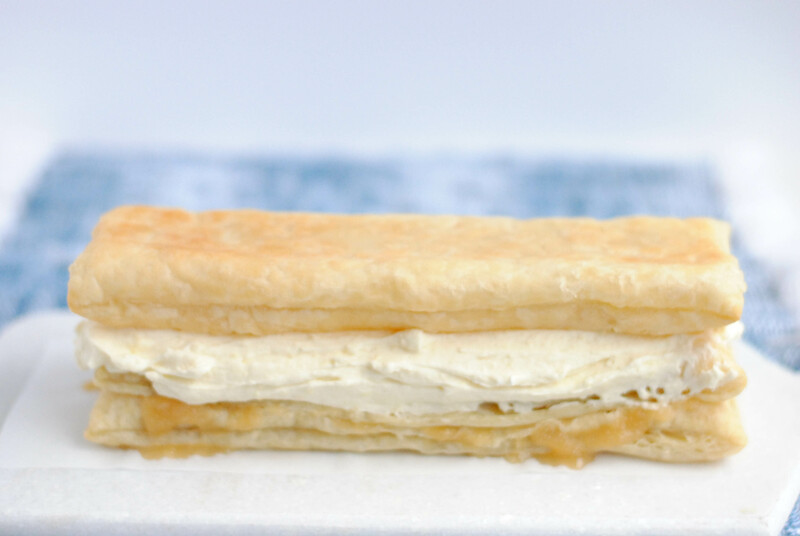 When you search images of millefeuille, French for “a thousand leaves”, what I have here is not exactly what you will see. 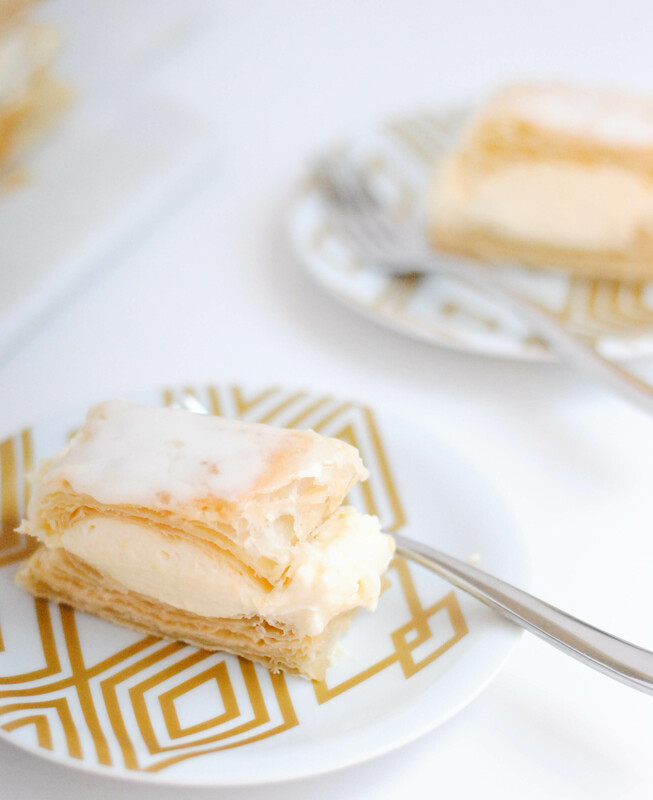 You probably know them as Napoleons, layers of puff pastry filled with all kinds of sweetness. Most of these fancy pastries are beautiful and well trimmed with lovely, even layers. 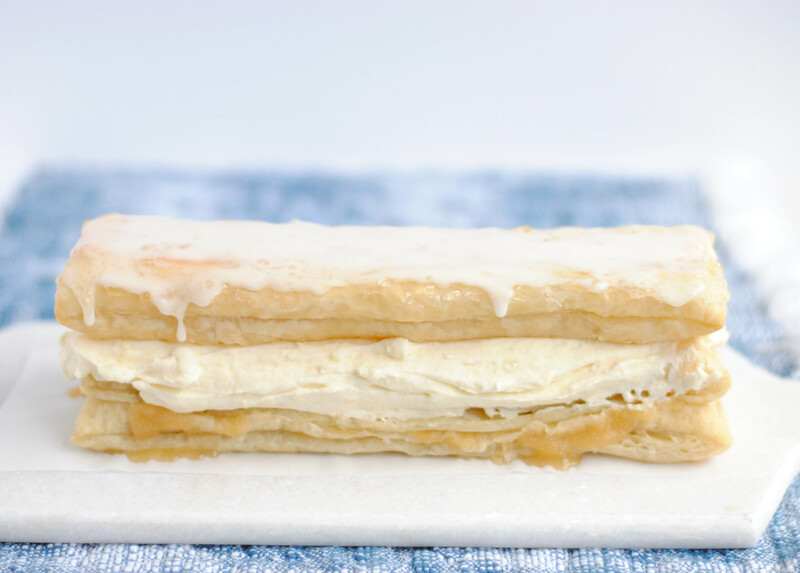 I’m the gal who’s ok with making something taste like a toaster strudel, so my millefeuille is not well trimmed, and the layers are not even. But it is so delicious, and really that is all that matters. One of the things about this cookbook that I don’t love is that sometimes there aren’t crystal clear instructions or it calls for an ingredient that requires you to make something extra for which there is no recipe and are no instructions. In this recipe a cup of pastry cream or vanilla pudding is on the ingredient list. I’ve made pastry cream before, but never in a small batch. Thankfully I found this recipe for pastry cream that made just the perfect amount. I did have a little scare when the fat separated out from the milk and I thought I was going to have to start over. The internet saved me again with this quick fix for a broken pastry cream! It also calls for whipping cream, but do not tell you to whip it. If I hadn’t done much baking I would not have thought to whip it. Maybe the authors of this book are just testing the baking knowledge of its readers, which I find to be tricky. Tricky Swedes. The recipe says to use 2/3 cup of apple sauce. I used 3-4 tablespoons, just enough to cover the bottom layer of pastry. Anymore and I was afraid it was going to just spill over the edges. Red currant jam is called for…I used apple jelly. 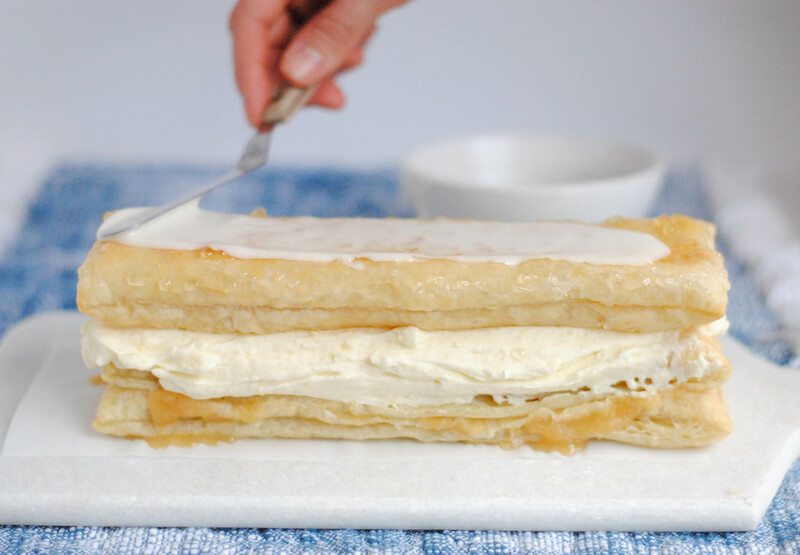 Other than all that, this is a fairly straightforward recipe 😉 Thankfully it uses store-bought puff pastry and is easy to assemble. The pastry cream can be made a day or two in advance, but don’t assemble this much more than a couple hours before you plan to serve it. It is best enjoyed fresh. In a small saucepan warm the cream over medium-low heat until tiny bubbles appear around the edge of the pan, but do not boil. In a medium bowl, whisk together the flour, sugar and salt. Add in the egg yolks, and whisk together. Pour the mixture back into the saucepan and cook over medium heat. Whisk constantly while it comes to a simmer. Once simmering, it will begin to thicken. Once large bubbles pop on the surface, continue to cook for a few more seconds while whisking, then remove from heat. Stir in the vanilla. 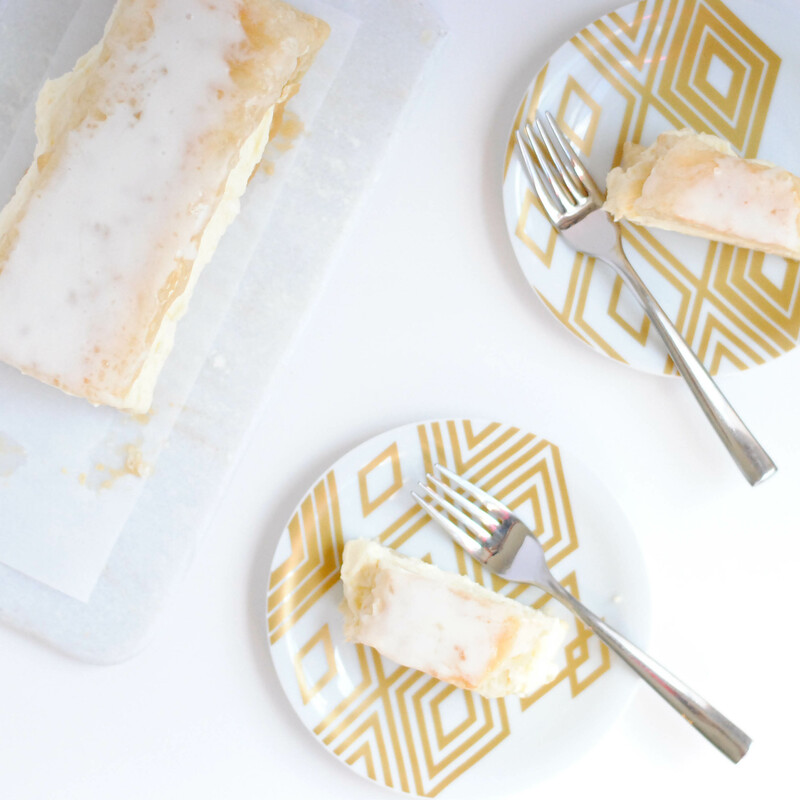 Scrape the pastry cream into a bowl, press a piece of plastic wrap directly on the surface, then chill in the fridge for at least 3 hours and up to 2 days. 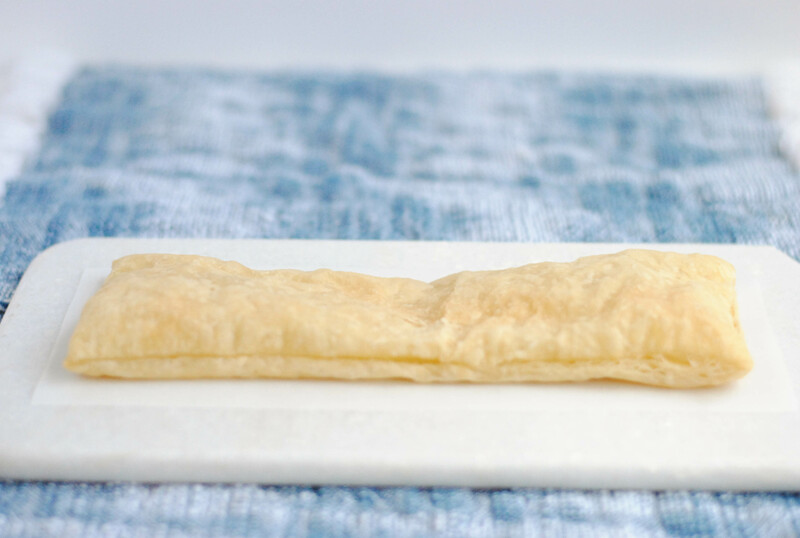 Place one layer of pastry on a serving platter. Spread applesauce evenly into this layer. 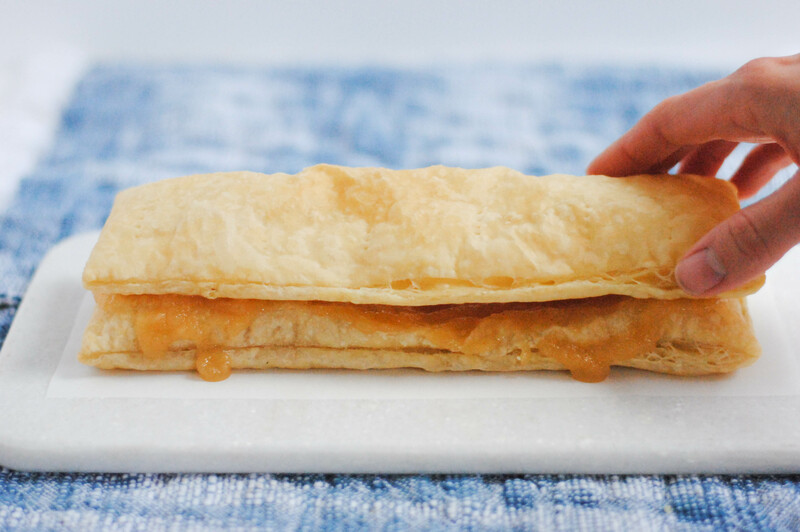 Place another layer of pastry on top and spread evenly with the pastry cream. 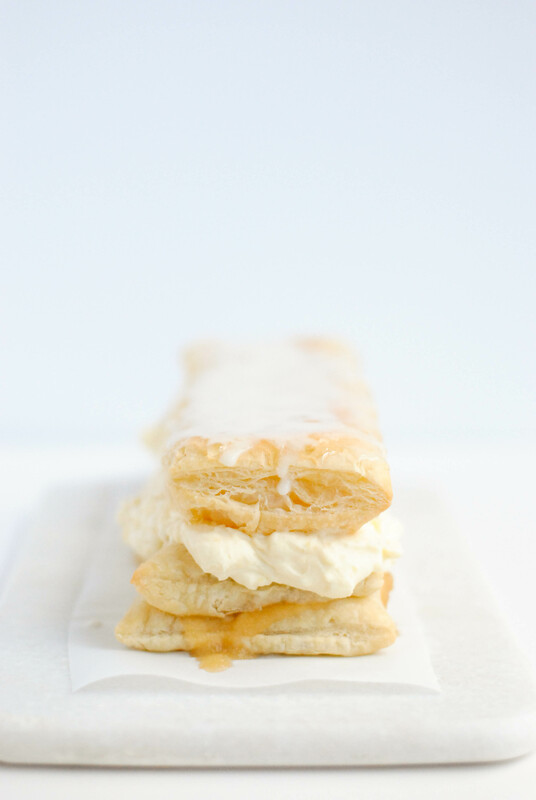 You could also put the cream into a pastry bag and pipe it nicely. Place the last layer is pastry on top upside down so that you have a nice flat top layer. 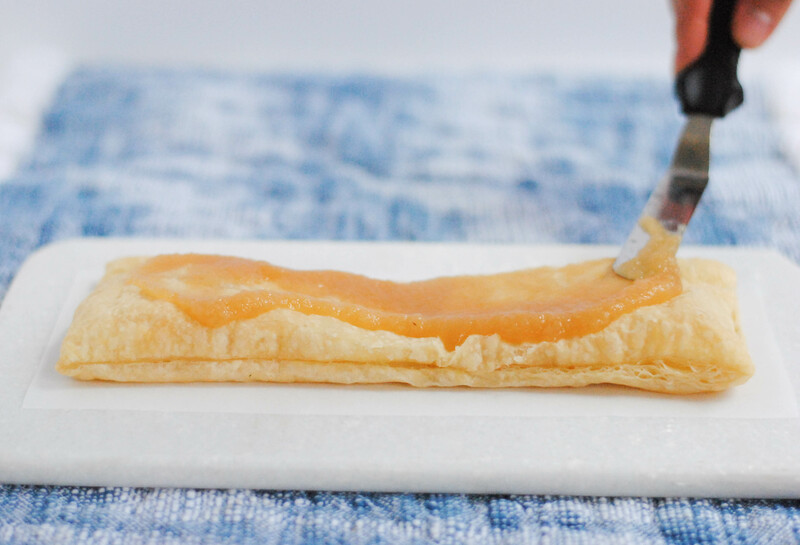 Heat the apple jelly in the microwave until easily spreadable, then spread on the top of the pastry. Whisk together the powdered sugar, milk/water and extract until smooth. Spread over the jelly and let set. Slice and serve or refrigerate for an hour or two.